This article is Part 2 of a 10 part series covering the Singleton Guild Wheel Project, a 10 deck project which contains only a single copy of any non-basic land among the 10 decks. Each deck is in the color combination of a different Ravnican guild. The methodology is introduced here and expanded upon each week featuring a deck part of the Wheel. Since the deck building process is constant decks are bound to change in between articles being published. We made it! Second editions are always the best, aren’t they? Whether it’s The Empire Strikes Back or the Beta set of our beloved game, knowing that it was worth another go-round is a great feeling. Thanks for coming back on this adventure through the Singleton Guild Wheel. This week we’re going through the most recent (and least fun to play against) deck that I built for the project: Tajic, Blade of the Legion. The Tajic deck comes from one of the most ridiculous and fun decks I brewed from Khans of Tarkir era Standard: Ride Down Control. The deck was all about landing a powerful and hard-hitting 3 drop like Goblin Rabblemaster or Brimaz, King of Oreskos then attacking haphazardly into the other team. The catch was I played 4 of Ride Down along with other combat tricks as the removal that made blocking either very difficult for opponents or very profitable for me. The deck wasn’t very good, but it was terribly entertaining watching Siege Rhino.dec lose to the RW aggro control deck winning with tokens. Since EDH doesn’t limit me to just the pool of Standard-legal cards anymore, I decided to go all in on the idea of watching the world burn. If there was a wrath to be played, it would be in the deck. Knowing that red is commonly seen as the weakest color in EDH, the Spike in me wanted to make sure I could make a red deck that was at least…ok. Taking a quick look at Tajic‘s EDHREC page it looks like most people go the ol’ soldiers route, which is fine but unoriginal. Soldiers are too formal, too rigid, and too fair. The Joker didn’t play by the rules, so neither will I. Moving forward, I decided to focus these sections a bit more and mainly highlight cards that top the 50% mark for the respective commander in overall decks, according to EDHREC. This helps demonstrate to advice-hungry readers to know whether I think a card is valuable, or if it has a popular but replaceable effect, albeit at a less efficient cost, or if it doesn’t make the cut for the sake of the Guild Wheel. 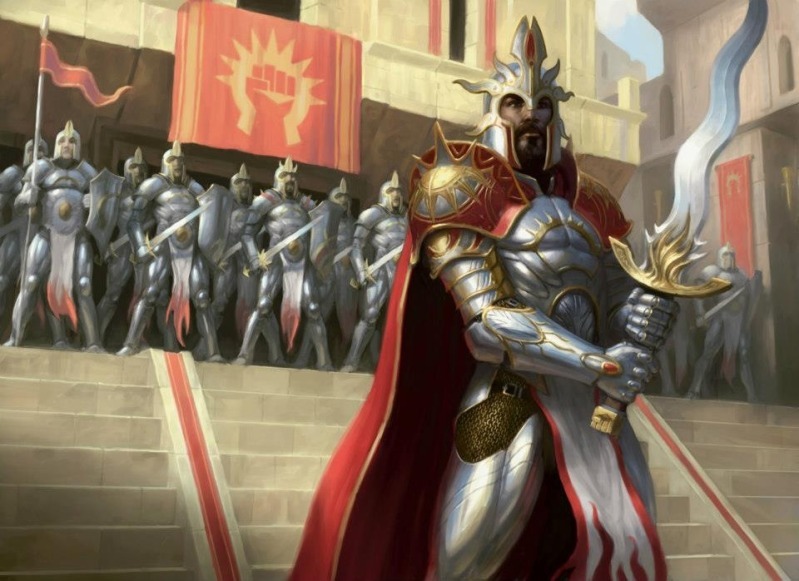 Plus, Boros is often seen as a boring guild for EDH so I need to try extra hard to spice things up. Making all 10 decks in the Guild Wheel tribal would be way too easy. Blue/green elves, white/red soldiers, black/red goblins etc etc. When I said I wanted each deck to feel unique and have no overlap I meant it. So out went all your typical soldier cards like Captain of the Watch, Mobilization, both versions of Odric and Thalia, along with any massive token makers like Hero of Bladehold. These are all fine cards, and I always enjoy a good tribal deck that loads up on anthem effects to overwhelm opponents, but this isn’t one of those decks. I sadly haven’t had much luck with Gisela, Blade of Goldknight in this type of deck before either. Don’t confuse that statement with “I don’t like to play Gisela,” because that’s the opposite of what I mean. She is one of those cards that I love to play because she can completely nullify what opponents are trying to do. Sadly, Armageddon and Obliterate don’t get along too well with casting your own 7-drop creatures. They just don’t, plain and simple. This counts doubly with as many board wipe effects that are in the deck. It’s just not worth the hassle of having too many more high costed cards in the deck when we want there to be little to none. I had to narrow it down to just a specific few that win(more?). The other edge of playing the common tribal sword is that a more controlling deck doesn’t share many cards with the traditional Tajic deck. This isn’t to say there aren’t cards that we absolutely want here in this part of our Guild Wheel though, quite the opposite. Assemble the Legion is played in a whopping 78% of decks with Tajic at the helm, which makes tons of sense. Not only does it flood the board with tokens to trigger Battalion, the tokens are Soldiers to boot which feed into the traditional tribal theme of the deck. We just want to play it because enchantments are decently hard to remove and if left on their own you will assemble your own legion of dudes that slowly take over the game. I am firmly in the camp that if you are playing a RWx deck, you will have to have a VERY good excuse not to run Assemble the Legion. Jason Alt seems to agree with me as well. One card that I’ve always felt was great in white decks that aren’t playing green is Land Tax. Considering that Land Tax is a repeatable source of ramp for white decks explains the price that it currently commands (nearing the $20 mark!). Taking a look at the decks that it gets played in you see that they are all white decks without green, showing that it really is the best ramp white has to offer since it almost always guarantees you a land drop every turn. This is especially important if you play an Armageddon on your turn, since the next time someone plays a land it won’t be your own. Your Land Tax then sets you up to draw those lands to make sure you’re coming back from the mass land destruction first, even before the green players! Mind’s Eye is a card that I strongly feel any non-blue decks should try to add as well. One of the most common themes I hear EDH players say about playing red decks is that it lacks GOOD card draw in the traditional sense of putting those cards into your hand with no strings attached. Mind’s Eye acts as a colorless Mentor of the Meek type of card that just happens to trigger at least once on your opponents turn, most times more. Only having to pay a single mana to draw a card is incredible value for RW players everywhere because we don’t get that kind of rate anywhere else. Anyone out there building a new Saskia the Unyielding should definitely consider making this artifact one of their first additions! As with most of my decks in the Guild Wheel, there is at least one real troll card. Not like Armageddon or the cards that make you the town jackass for the game, but a real “nanny-nanny-boo-boo,” type card that let me sit and watch people fumble for answers. Since our commander conveniently is indestructible it makes a very convenient target for the hugely under-appreciated Pariah’s Shield. According to the card’s page there are only 438 decks reported to EDHREC out there playing Pariah’s Shield…how is that even possible! Is the card just that old that nobody knows it exists? That’s got to be the answer, nothing else makes sense. Seriously people, this card is absolutely silly. For all the dorks that think playing Avacyn, Angel of Hope is cute there have to be more than 438 that make some online list playing this card. I don’t think there’s been a more satisfying experience outside of playing my super un-fun Narset, Enlightened Master deck than slapping Pariah’s Shield on Tajic, blowing up all the world and then 2-ing people to death. Something you might have noticed in the deck list is the odd number of 0-drop creatures in the deck. Well my friends, let me tell you about a fun deck that used to see play years ago that was known as Fruity Pebbles. This deck was played by the great Hall of Fame player Kai Budde years ago at several Pro Tours. The deck wins by having Goblin Bombardment on board with Enduring Renewal, then playing any number of 0-drop creatures like Crookshank Kobolds, Ornithopter or Shield Sphere. You sacrifice the free creature to Goblin Bombardment to have Enduring Renewal bring it back to your hand, which you would again cast for free and lather, rinse, repeat. Since this loop does indeed go infinite it serves as a way for us to win after we have blown up all the lands for zero mana. Since we’re in the habit of playing 60-card decks ported into EDH for this deck, I figured it would be a way for me to add some hilarity to this deck and save what goodwill I could with my friends. If you ever want super cool stuff to do with lands, just look at Odyssey block, especially in red. Price of Glory is just one of the MANY red cards that make everyone play on MY axis. Either everyone plays at sorcery speed or they pay for it. Price of Glory is another of of my favorite punisher cards and unless your friends play a literal heap of mana rocks they more than likely won’t enjoy this card much. Well that’s it for this week! Is it my sophomore slump or a fitting entry into the series? Again, I know Boros isn’t a glamorous guild to play, but someone has to do it. You may as well make sure that nobody has fun while you’re doing it I guess. Selesnya, Naya, Temur, Ink-Treader...whatever you want to call it. Matt knows a good creature-combo deck when he sees it. He is the only EDHREC writer that was sad to see Leovold go. Outside of EDH plays Legacy and Modern and got his first career Pro Point at GP Louisville. Matt lives in Colorado with his Greatest of Danes, Moose and no cats because cats are terrible.